A study published in Royal Society Open Science has found that in societies around the world, there is a literally unspoken expectation that people will cooperate with each other. Researchers observed requests in informal interaction in a diverse sample of languages and found not only that requests are usually complied with, but that people hardly ever say ‘thank you’ as a result. Rather than implying that people are universally rude, the discovery reveals a cooperative stance in human affairs. The study showed that in diverse societies worldwide, when a person makes a simple request, the other person will much more likely to comply than decline (= a rate of seven to one), and in a majority of languages, thanks are given only once out of fifty times that someone complies with a request. So, it should not be surprising that many of the world’s languages have no word for ‘thank you’. In this regard, there is nothing exotic about the fictitious Dothraki language spoken on Game of Thrones; many real languages are the same, including Cha’palaa, spoken in Ecuador, and Murrinhpatha, spoken in Aboriginal Australia, both of which featured in this study. The study found that even in languages where children are aggressively taught to say ‘thank you’—e.g., English—the rate of thank-yous is very low in cooperative events in informal interaction. The study supports the view that in everyday interaction, cooperation is the rule: social life thrives because it’s in our nature to ask for help and pay back in kind, rather than just in words. This project, coordinated by Simeon Floyd (Universidad San Francisco de Quito, Ecuador) and Giovanni Rossi (University of Helsinki and UCLA), is headed by Nick Enfield (University of Sydney), director of the European Research Council grant ‘Human Sociality and Systems of Language Use’. See below for full list of team members. 1. When people are asked to do things in informal interaction, they usually comply. In our recordings of informal social interaction in diverse languages, we found that on seven out of eight [=928/1057] occasions that a request is immediately responded to, that response will be compliance. This demonstrates a strong cooperative stance in human interaction. 2. Contrary to expectations, people around the world hardly ever say ‘thank you’ when someone fulfils a request in informal interaction. We collected video recordings of informal home/village interaction in a diverse sample of languages, from five continents. We looked at cases when Person A makes a request (eg ‘Could you pass some water?’) and Person B fulfils that request (passing some water), and we checked to see whether Person A then acknowledged the service (eg by saying ‘thank you’). We found that, on average, people overtly express gratitude on just one out of twenty times someone fulfils a request. 3. Speakers of some languages say ‘thank you’ more often than others (but still not often!). The languages in our sample formed two groups. In the majority of languages, like Cha’palaa and Lao, ‘thank you’ occurs hardly ever: on one out of fifty occasions at best. In a second group of languages, including English and Italian, gratitude is expressed significantly more often than the first group, but still on a small minority of occasions: in informal English conversations, people express thanks on only one out of seven times a person fulfils a request. 4. This does NOT mean that people are universally rude (nor that speakers of English are less rude than speakers of other languages). The finding that overt expression of thanks is rare goes hand in hand with our finding that people almost always comply with requests (compliance outnumbers rejection seven times to one). Further, when no gratitude is expressed (as is usually the case), people do not remark on this or treat it as a social omission. This suggests a cooperative stance in human affairs. Our study reveals an unspoken expectation that people will cooperate with each other, meaning that thanks are not needed. 5. When Person A asks for help from Person B in informal social interaction, one pattern is universally most common: (1) Person B fulfils the request, and then (2) no thanks are given. This shows that in human interaction around the world, there is literally an unspoken agreement that people will cooperate. The reciprocity of such cooperation is maintained by a tacit understanding of people’s social rights and duties to mutual assistance and collaboration. In turn, the question arises: on those rare occasions someone does say thank you for complying with a request, why do they do it? 6. Many languages of the world lack a word for ‘thank you’. 7. Thanking is used in special situations only. Exactly why thanks are given on rare occasions is a topic open for further research, but a follow-up study by co-authors Rossi and Zinken suggests that thanking becomes relevant when a requested action falls outside of the usual rights and duties that people have to each other, when people go beyond the normal call of duty. 8. While the expression of gratitude is rare across the board, there is minor but significant variation among languages. The lowest frequency our study found was in Cha’palaa (whose speakers never said ‘thank you’ after someone complied with a request) and the highest was in English (whose speakers said ‘thank you’ one out of seven times someone complied with a request). This lends support to anecdotal evidence that the explicit expression of gratitude is more frequent in certain languages than in others. Two languages, English and Italian, have similar relatively higher rates of expressions of gratitude — although these rates are still far lower than one might expect based on the cultural ideology of politeness around thanking in Western cultures (as found, for example, in children’s books). 9. English is an outlier; as is often the case, English is not representative of the world’s languages. The significantly higher rates of expressing gratitude found in English and Italian in this study show that, as is often the case, speakers of English and other Western European languages are “outliers” that are not representative of the diversity of the world’s languages and cultures. 10. People’s beliefs and ideals about language often do not match well with reality. English-speaking children are taught that we should say thank you whenever possible, but in reality, in our informal everyday interactions, speakers of English and Italian acknowledge gratitude for fulfilling a request on just one out of seven occasions. 11. Discovering facts about language requires direct observation, not introspection. Our findings are based on systematic, direct observation, not second-hand accounts or introspection. Our unique contribution was to collect first-hand data from around the world, and methodically compare what we saw. 12. We should not conflate the feeling of gratitude with the act of expressing it. The maintenance of social reciprocity does not depend on the verbalisation of gratitude. We examined 1057 instances of request-type sequences extracted from recordings of informal conversation in eight languages around the world: Cha’palaa (a minority language spoken in Ecuador), English, Italian, Lao (spoken in Laos, Thailand, and Cambodia), Murrinhpatha (an Australian Aboriginal language), Polish, Russian, and Siwu (a minority language spoken in Ghana). 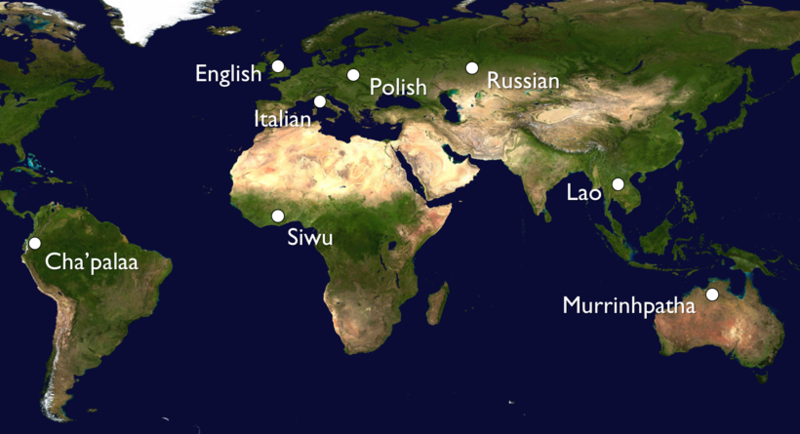 These languages are shown on the map below. We collected over 1000 examples of complete request-type sequences (averaging around 130 per language) in our field recordings, and the researchers coded these using an agreed set of measures. This was to make sure that our analysis was based on directly observed facts about what happens in real, everyday language use. In all of the languages, we restricted our focus to those requests in which the sequence was complete, namely, where the request was granted or rejected. In these cases (a total of 928), we checked whether Person A said ‘thank you’ or something comparable. World map showing locations of data collection for the eight languages in this study. We did NOT rely on second-hand reports about the languages we studied. We did NOT study the expression of gratitude by consulting phrase books, dictionaries, or travel reports. Reports about how people talk are often skewed by biased impressions. This is one of the things we show with our study: despite strong expectations that English speakers would express gratitude for compliance with requests most or all of the time, we found that they do so on a small minority of occasions. Who are the authors of this study? Check out the paper or the supplementary materials. Note: for sharing and linking, using the DOI link is recommended as that will always lead to the version of record and is trackable by services like Altmetric and ImpactStory.